New Zealand were far too strong for a new look USA side, beating the hosts 6-67 at a triple header at Soldier Field in Chicago. The USA had named 13 uncapped players in their match day squad and the inexperience told as New Zealand dominated throughout. While New Zealand were on top everywhere, it was once again their driving lineout which proved most damaging, as it was against Australia in Sydney against Australia in August. Three of the first half tries came from the maul as the forwards took control. Tighthead prop Aldora Itunu opened the scoring off one such lineout drive and the Black Ferns often turned to that tactic as the home struggled to hold them there. No 12 Chelsea Alley continued her Farah Palmer Cup form, plunging over from a pick and go. Lock Eloise Blackwell scored the first of her double from another well-executed lineout maul before captain Fiao’o Faamausili nailed her 16th Test try from yet another drive. Eagles wing Kelci Stockert came closest to scoring for the home team when she chased a chip through by Kimber Rozier, but the ball beat her over the dead ball line. The second spell saw right wing Renee Wickliffe come to the fore, finishing in fine style for her double. Fullback Selica Winiata scored an opportunist try off a break by No 10 Ruahei Demant. The Eagles were competitive in some scrums, but were shunted off the ball in the 65th minute to allow Kendra Cocksedge to score an easy try. The halfback chalked up 15 points, with some conversions from wide angles. Centre Stacey Waaka celebrated her 23rd birthday with a try in the corner. But the biggest cheer of the day came in the final throes when young debutante Wellington wing Ayesha Leti-I’iga, who tackled well but had few attacking opportunities – as well as having a try ruled out due to a forward pass – crossed out wide. 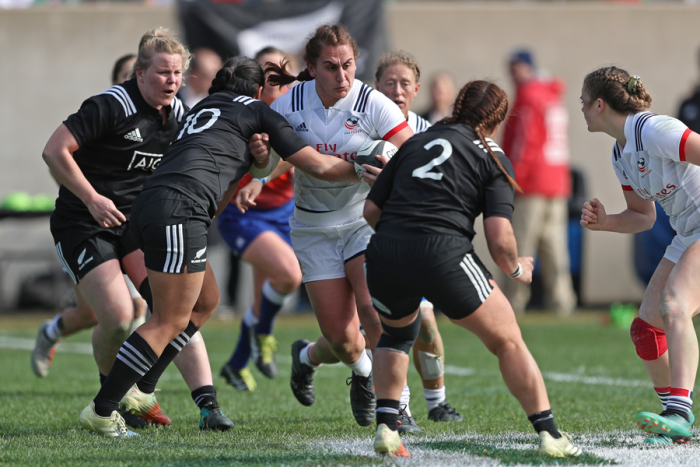 Best for the Black Ferns were lock Charmaine Smith, industrious as ever, while the back-row duo of Aroha Savage and Charmaine McMenamin ran hard and freely. Alley set up play well in midfield and on the fringes with her bruising charges or soft passes. “You couldn’t ask for anything more from our girls… we are all one. The starters build the pressure and then the warriors come on and finish it off,” says Faamausili. This was the Black Ferns’ eighth Test match win on the bounce. A sterner challenge awaits when they face France in Toulon next Saturday. The Eagles will travel to London to face England.